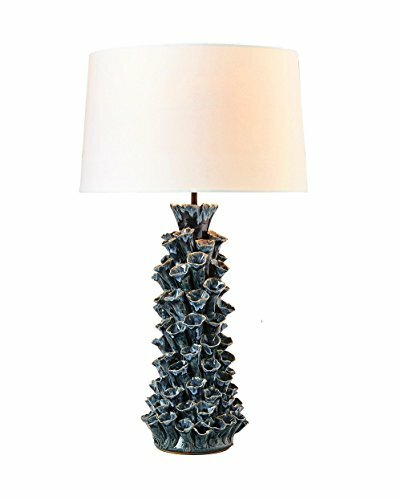 • Handmade Ceramic Coral Blue Design creates Classic Touch for any Room. AMAZINGENUITY & CRAFTSMANSHIP: The Barnacles Design of the table lamp has been carefully Hand Crafted by a professional Thai worker. Then, this experienced craftsman designed and built this wonderful table lamp. In other words, the Table Lamp is 100% handmade with exceptionally good workmanship so it is well made and sturdy. It won't fall apart, nor break. Press the ''Add to Cart'' button and what you will receive is high quality and excellence. A LAMP THAT HAS THE IDEAL SIZE: Why is the size of this Lamp ideal? It is ideal because it can be used not only as a table lamp but also desk lamp, console lamp or even as a nightstand. The dimensions of the map are 22.5 Inches high, 6Inches wide and 6 Inches length. So whether you wish to place night lamp on a table or on the console table, there won't be any problems concerning its size. EASY TO INSTALL AND OPERATE: This table lamp may have a unique design, but it works just like any other Lamp. It is fitted with a high quality E26 socket and a Black cord with an on / off switch. So all you have to do is place it on a Table or End table, plug the light into a socket, put on the shade and the switch will do the rest. BUY NOW AND EXPERIENCE THE MAGIC YOURSELF! If you have any questions about this product by O'THENTIQUE, contact us by completing and submitting the form below. If you are looking for a specif part number, please include it with your message.